Founded in 1965, Les Vignerons d’Estézargues is located in the Gard département on the ‘wrong’ side of the Rhône, some 20 kilometres west of Avignon. It handles fruit sourced from almost 400 hectares of vines, mostly classified as either Côtes du Rhône or Côtes du Rhône Villages Signargues, the latter an appellation created in 2004 for red wines only and encompassing the communes of Estézargues, Domazan, Saze and Rochefort du Gard. Unlike on the right bank of the river, the vineyards here are more dispersed and tend to be located in smaller pockets, often within individual clos, and surrounded by woodland. Rather than the mono-culture of the plains to the east, the terrain here is more undulating with some moderate slopes. Whilst it is possible to find the typical galets of the region, the soils here are made up more of red clay and pebbles. During the early 1990s, the co-operative moved towards a more qualitative approach and rather than selling wine off in bulk, began to concentrate on bottled sales, creating a range of ten individual domaine wines, sourced from the most significant members. This enlightened policy was put together by winemaker, Jean-François Nick, who arrived here in 1989 and his early work has been continued by Denis Deschamps who took over the position in 2002. Whilst it is possible to find the 10 domaine wines in the range, the winery also harvests grapes on behalf of a further 23 growers, some with less than half a hectare of vines. Although now established and selling in several international markets, notably the USA, Japan and Scandinavia, an impressive 50% of the production is still sold directly from the cellar door. In the cellar, only natural yeast fermentations are employed and sulphur levels are kept to an absolute minimum. Neither is there any fining or filtration on any of the red wines. 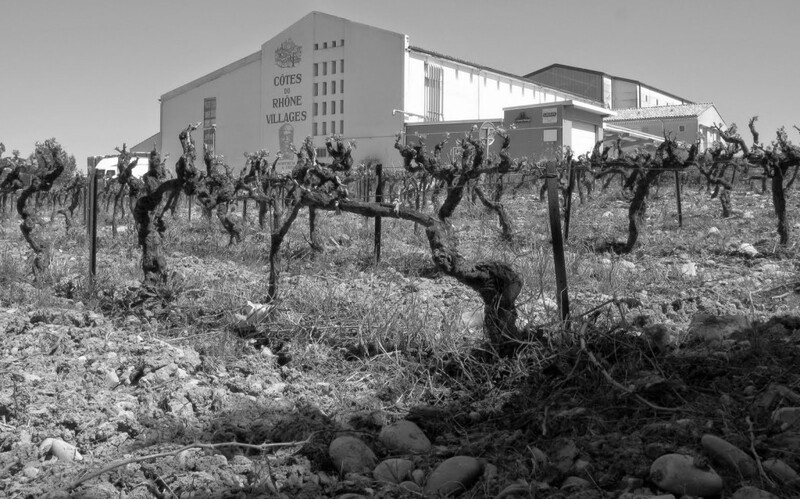 Being one of the warmer pockets of the southern Rhône, the vines tend not to be under too much threat from rot and the crop arrives at the cellar in a healthy condition, which helps negate the use of additives; the natural alcohol and tannins within the wines adding to their stability. We have elected to concentrate initially on three separate wines produced here. The first, I suspect, will prove to be controversial. Painted by an unknown Scandinavian artist, the audacious nature of the label will no doubt cause some concern. The wine itself is a simple blend of Grenache and Syrah, raised in tank. Of the two estate wines featured, the Domaine de Pierredon is based on 60% Syrah and 40% Grenache, whilst the Domaine Montagnette is a blend of 50% Syrah, 30% Grenache and 20% Mourvèdre.